A blender is an important part of anyone’s kitchen. They can be used for a variety of things such as: mixing, pureeing or emulsifying food. As such it is necessary to pick out the best blender for your use in order to suit your needs. 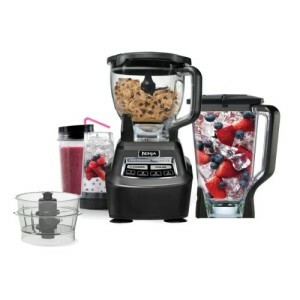 With that said, ninja blenders are currently one of the best in the market. But with all of these choices it can be hard to pick the one that suits you. That’s why I have compiled a list of the best ninja blenders below. If you want more information on each blender check the top menu for ninja blender reviews. Power wattage – Buy the one that will suit your needs. You don’t need a 1,500 watt blender to chop a few soft foods and crushing hard solid things might require more than a few hundred watts. For general use around 1,100 Watts should be more than enough. Weight – If you’re planning on moving the blender around a lot and don’t want to constantly shove a 15 pound blender back and forth you can pick one of the lighter ones posted in this ninja blender reviews page. Jar Volume – For those people who like to make big portions or store things for later you might want to look into the 72 oz blenders to fulfill your size needs. For others a 40 oz or a 42 oz cup size would do just fine. 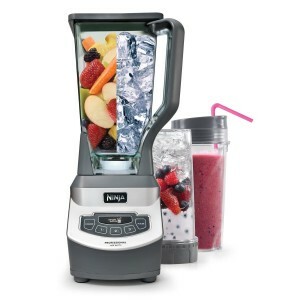 Consumer Reviews # – High amount of reviews indicates that this blender is a popular choice. Popular is not always the best but often times they are above average. Rating – It might come in useful to listen to those who already owned the blender before as they will point you in the right direction to make your choice. I would personally suggest the Ninja BL660 as this is the one that I prefer to use the most out of my blenders posted under ninja blender reviews. Starting from the chrome finish to the adjustable speeds to the pure ice crushing powers this blender gives both vitamix and blendtec a run for their money considering it’s great value. The single serve cup allows me to grind smaller things like flax seeds which usually can get stuck to the bottom of bigger pitchers. It also allows the smoothies to be smoother due to their more blender-like blades as opposed to the main pitcher’s ones. Talking about blades you might want to watch out while washing them because they are really sharp! Single serve cups can act as your personal included magic bullet and they can be cleaned even easier than the main pitcher’s ones. The only con that I can think of is that it only comes with 2 cups and finding other cups can be a pain in the rear. Plus it is relatively weak in terms of blending some greens as they’ll have a gritty feel to them but this problem can be alleviated by using the single size cups. Finally, main pitcher’s blades are similar to that of a food processor and you can use that to quickly chop some foods if you only use it for a short time. Now this blender won’t replace a vitamix blender but I would definitely recommend this ninja to anyone looking for a great affordable blender. If the BL660 is out of your range or you’re just looking for a different blender I can safely recommend the Ninja Kitchen System Pulse BL204. Another masterpiece by ninja, this blender will chop, slice, dice and blend pretty much anything you desire. One of its unique features is that it has a cookie paddle which you can use to make some cookies to go along with your smoothies . It can also be used to create cooking dough which is bound to be useful to some of you. Still retaining the quality of the BL660 the BL204 also has the pulse mode which can replace a standard food processor. This is partly possible with the blade design which allows you to chop foods without blending them if you use a few short pulses. This kit also contains the previously mentioned single serve cups but you already know my view on them so I’ll just skip this part although I will mention that it has 3 of them instead of the one for BL660. The BL204 is also pleasant to the eye and I can easily see it complimenting multiple kitchen types. It is also relatively shorter than some other blenders at only 14.2 inches which should fit in nearly every kitchen. Finally, at 700 W it’s no weakling and that definitely shows as it has yet to fail me at chopping/blending/crushing anything that I throw at it (within reasonable food limits). The first thing you might notice is that this blender is that it’s huge. Well I suppose at least it live up to its mega name but can definitely pose a problem in some kitchens as it takes up a lot of space. But it’ll stay its ground due to the built-in suction cups at the bottom of its feet. Now onto it’s blending capabilities. I can sum it up in 2 words – it works. It will blend your smoothies with frozen fruits no problem as the 1500 W of power provide more than enough strength to crush the strongest ice. But it’s only downfall comes from the reason that its blades are shaped a differently than other blenders which will cause some nuts to not be blended smoothly and instead have rather have small chunks left over. This problem persists with fibrous foods and some greens. The single serve cups help to grind the nuts more finely but it can only do so much. But don’t let that detract you from this blender as you can still blend/mix yogurts, protein shakes, berries and fruits without a hitch. Other features include dough-making and the food processing capabilities which I have mentioned in previous posts. Now that you’ve seen all of these best ninja blender reviews and seen our opinion of the top ones, it is up to you to choose the one that will suit your needs. All in all I will say that on a budget, the ninja blenders do a good job. They come pretty close to vitamix at a much cheaper price. Once you have your blender visit the recipes page to see some quick recipes while you are waiting for you blender or if you just want a few quick and delicious recipes. New blenders are being added all the time so if you would like to recommend a new blender that we have missed leave a comment below.